TeachStreet, a Yelp-like service for real world classes (cooking, dog obedience, music lessons, ballroom dance, foreign language, golf, yoga, etc. ), is launching a marketplace feature for teachers to be able to coordinate payments from students. TeachStreet, which serves seven metropolitan areas in the U.S. including New York City, Silicon Valley/San Francisco and Seattle, allows instructors to upload information about classes. Users can look for available classes, and read and write reviews on the course and the instructor. Currently, the site includes a selection of more than 135,000 classes and teachers, across more than 700 subjects and categories. TeachStreet payments enables credit card payments for a portion of teachers/classes, letting teachers who are unfamiliar with e-commerce be able to elicit sales leads from the web. TeachStreet’s founder, Amazon and JibJab Alum Dave Schappell, tells us that the site is powered by PayPal Website Payments Pro to make it easy for both students and teachers to use the system. 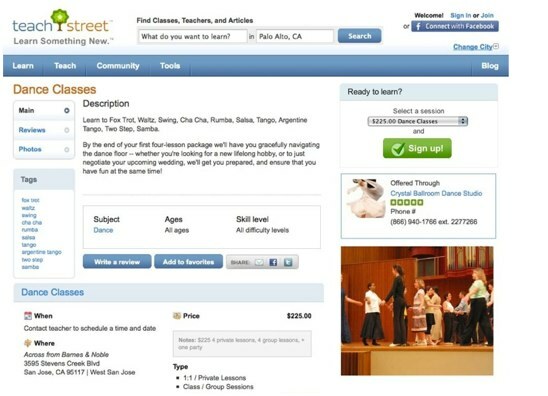 TeachStreet charges students a 5% for booking and charges teachers a 4.9% processing fee. Teachers pay an additional 2.5% first-time-student payment fee to TeachStreet. While adding a listing and profile on TeachStreet is free, teachers only pay out to the site when a sale takes place. TeachStreet plans to also let teachers also opt out of the fee-model and pay monthly fee but the pricing has not been determined. TeachStreet doesn’t just simplify e-commerce for teachers. The site is also letting teachers use a call-tracking service (powered by Twilio), which gives teachers an 1-800 (or local) number that allows any messages to be forwarded to email and lets teachers keep their numbers private. TeachStreet also provides teachers with data and analytics, including number of visits and views, number of sales leads from e-mail messages, phone calls and site-visits, and competitive information on other teachers and classes in their categories and geographical areas. There’s no doubt that TeachStreet’s new features are going to be particularly useful to teachers who want to implement e-commerce to get sales leads, but don’t want to pay to power the site themselves or simply don’t know how to navigate the process. It’s seems like a win-win for teachers, especially considering that TeachStreet’s fees are fairly low. TeachStreet has had a bittersweet year so far. The startup had a small round of layoffs in the spring, but rebounded with a $1.2 million extended Series A funding round in May from Madrona Venture Group and Bezos Expeditions. Competitors include School Of Everything and Libersy.